Joy Chan 陈佼, who regularly posts insightful comments on China’s IT/Web2.0 world, posted an informal analysis of Chinese video-sharing sites 视频站点 on Nov. 6 that has gotten a lot of play in the Chinese blogosphere. …All of the 7 have received venture funding. 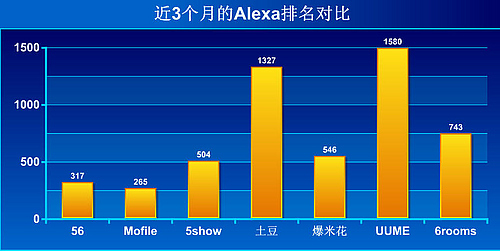 Even the top-rated Chinese site, Mofile, is only 265 on Alexa. None have really broken through in terms of traffic and talk of “video sharing sites exploding in China” is no more than just that–talk. Of course, there’s still a lot of room for growth. UUME says it’s the largest site in China for video sharing, which is clearly a joke as it’s got the lowest Alexa ranking. The sites with the most exposure are Tudou, 56, and UUME, but the most surprising was 5show. This site, which is hardly mentioned by anyone, is a bright spot and even took the top spot [in the comparison above]. The overall trend for all of the sites is upwards…with the spread of broadband this will only increase. 56, 5show, and Mofile are the top 3 Chinese video sites, according the the rankings…China’s videosharing sites are in a period of competition, where the user experience is pretty much the same at each site. Some of these will die out eventually.